Home » October Unprocessed Posts » So… How’d it go? Well, we did it!! At last count, 6,133 people signed the October Unprocessed pledge, and we shared three guest posts every single day this month — a whopping 93 posts! I’m going to (try to) keep it brief today because, frankly, I could use a day off! But I do want to say just a couple of things. It’s staggering the number of people who came together and volunteered their time, expertise, and talents to help make this project happen. First and foremost, I want to thank all the guest authors. Their contributions were mouth-watering, creative, beautiful, helpful, and so much more. I’ve said it before, but it bears repeating: The food blogging and wellness community is one of the finest groups of people I’ve ever been blessed to know and be a part of, and for that I am truly blessed and grateful. 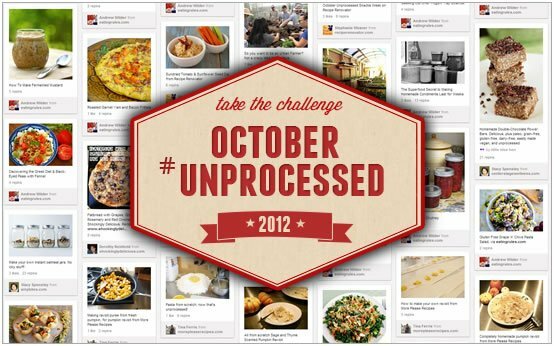 Thanks to Stacy Spensley from Center Stage Wellness, for The Official Guide to October Unprocessed (which I hope you found helpful! ), and for giving us excellent strategies for overcoming mental hurdles. And to Sabrina Modelle from The Tomato Tart, who designed the wonderful logo and shared her delicious, vegan cream cheese recipe. I’m grateful to everyone who helped spread the word about the challenge — including so many bloggers and reporters. Every blog post, article, Tweet, and Facebook share made a huge difference. I’m especially indebted to the talented Rene Lynch at the Los Angeles Times, who has championed the cause for the past three years. There are also two people who have been working completely “behind the scenes” that deserve some public praise. First is Hannah, my awesome assistant. We’ve been working together since February to bring this whole project together, and I credit (what’s left of) my sanity to her. And then there’s Matty, my wonderfully supportive husband. He’s put up with all my unprocessed shenanigans… and my long hours in front of the computer. Thanks, honey. Finally, thank you to everyone who took the challenge and participated in any way – including those folks who weren’t ready to sign the pledge, and just read along all month. This challenge is really all about all of you, and I hope it’s been a positive experience. I’m guessing most folks had their ups-and-downs, too (that’s why it’s called a “challenge,” after all). I’d love to hear the highlights and the most positive “takeaways” from your experience. What I’m most interested in hearing about is how this experience may have changed you. What will you take with you into November and beyond? Please share in the comments below! 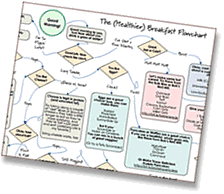 PS – I’ll be putting together a thorough survey in the next few days, so if you have specific thoughts and feedback about the challenge itself, that’ll be the place to let me know. I’ve done that in the past and it’s been tremendously helpful – I consider all of the feedback very carefully! Eating unprocessed food is a lot easier than I thought it would be. I am so thankful for the experience. I was shocked by so many foods that are processed and the unnecessary ingredients added to foods. The bread I baked didn’t have sugar added and it was delicious, why do all the baked breads in my grocery store have sugar? Unsalted butter, every one in my grocery store had added flavoring. A lot of items in the “Natural Food” section of my grocery store have ingredients I can’t pronounce let alone make at home. I am so much more aware of what is in the food I eat. I may not be as diligent as I was in Unprocessed October but I will be more selective in my food selections in the future. Thank you Andrew. My second year, and I’ve been trying to behave for the other 11 months in between. This October saw me kick my sweet drink habit: no sugar, no HFCS, no Splenda, no Stevia… all of it removed from my beverages. I especially enjoyed the daily articles. I’ve made my own fermented mustard and onion dip, and bought one of the contributors books. Thank you so much for doing all the work and getting all people together to write. It was way easier than I thought it would be! It is something I will continue to do the rest of my life! Thanks for the Challenge! Its changed the way I look at food…I’ve learned SO much!